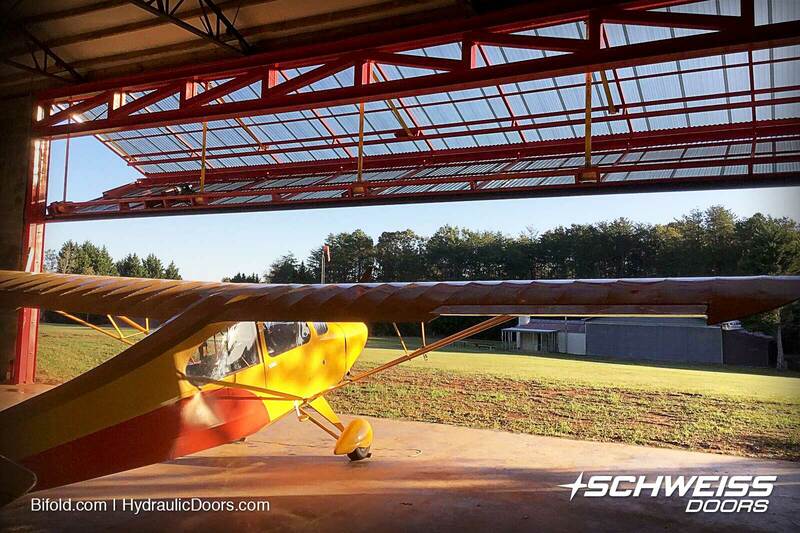 The bifold liftstrap 50 ft. door has a glass panel across it to allow for additional outside light to enter. 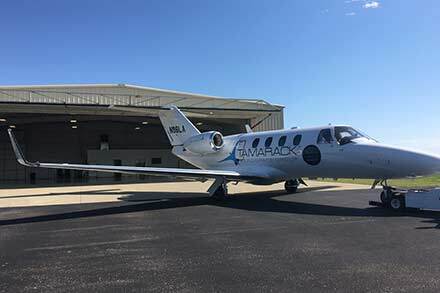 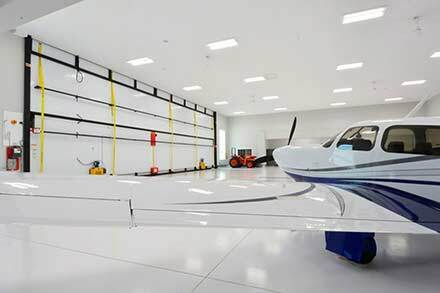 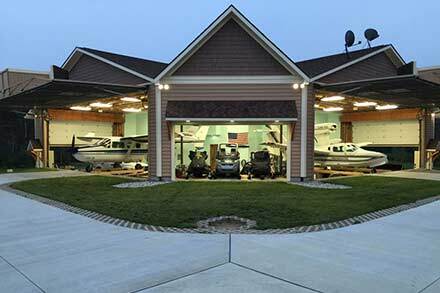 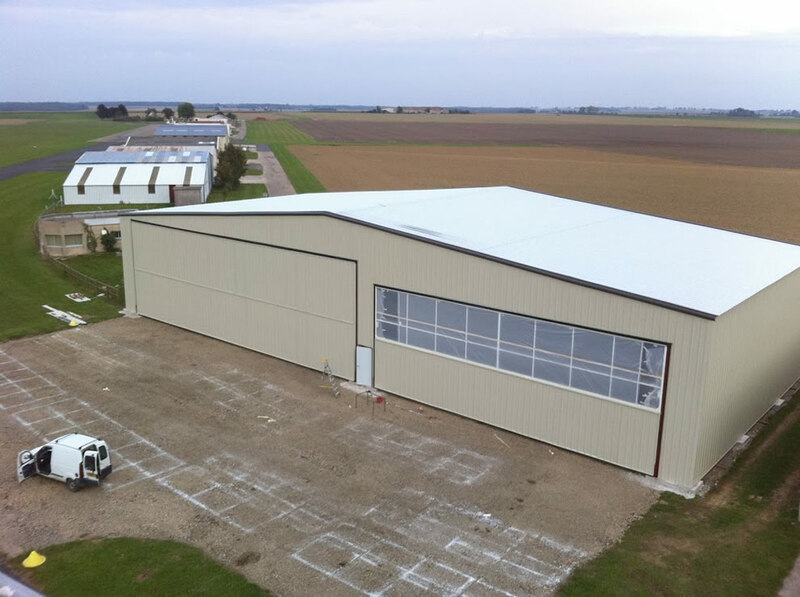 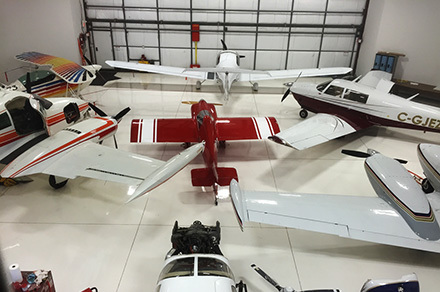 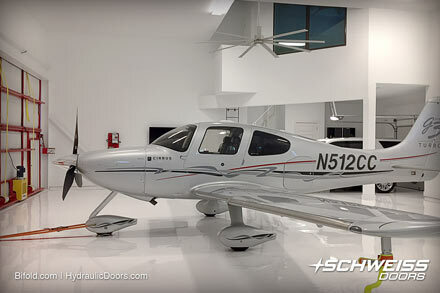 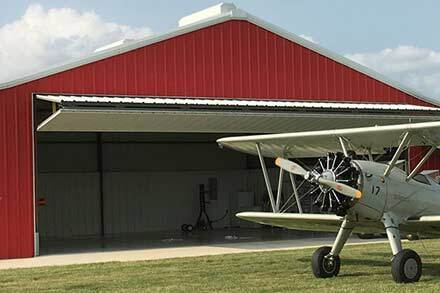 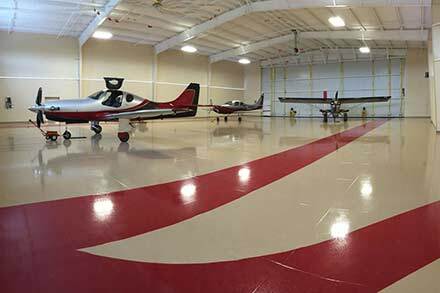 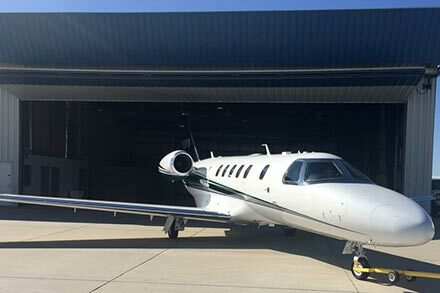 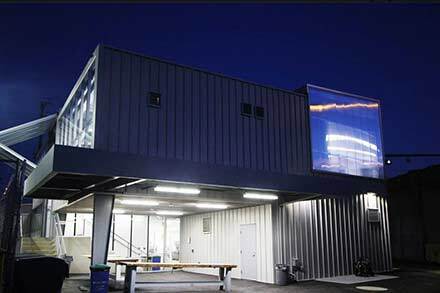 Aviation Experts new hangar is used primarily for shop purposes; mostly for working on recreational aircraft up to small turbo-props for private and corporate use planes. 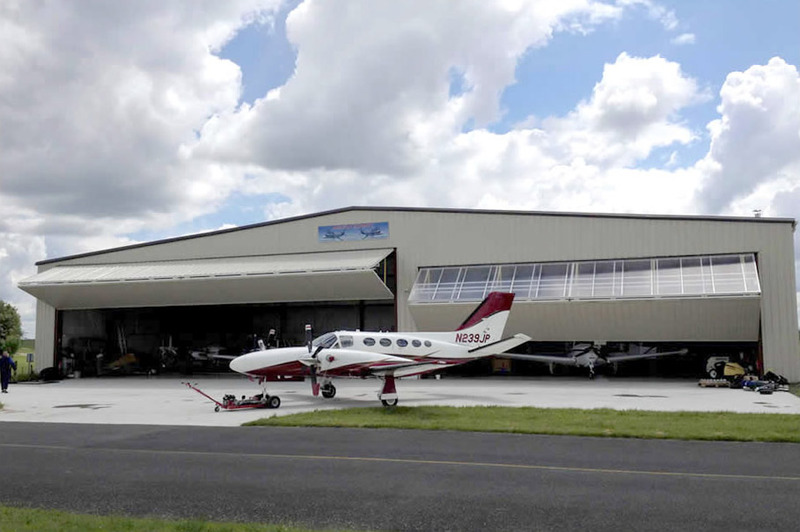 Aviation Experts SARL is an established 15-year-old French aviation maintenance business and aerial photo survey and mapping business that services not only France and Europe but is called out to far reaching overseas locations. 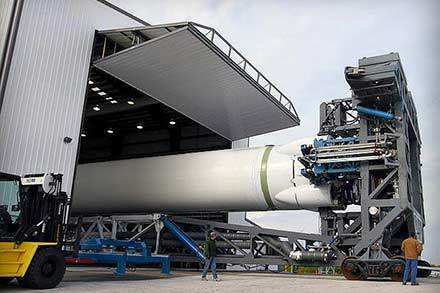 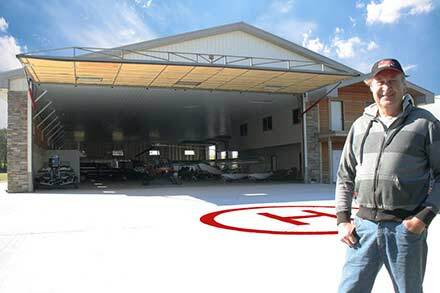 Its hangar and base of operations is located in Nangis, a 7,500 population commune in the Seine-et-Marne department in the Île-de-France north-central region of France, approximately an hours drive south of Paris. 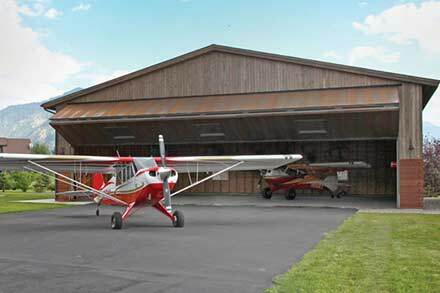 "Photo surveys can be used for general mapping and building projects for such things as highways, dams, anything really. 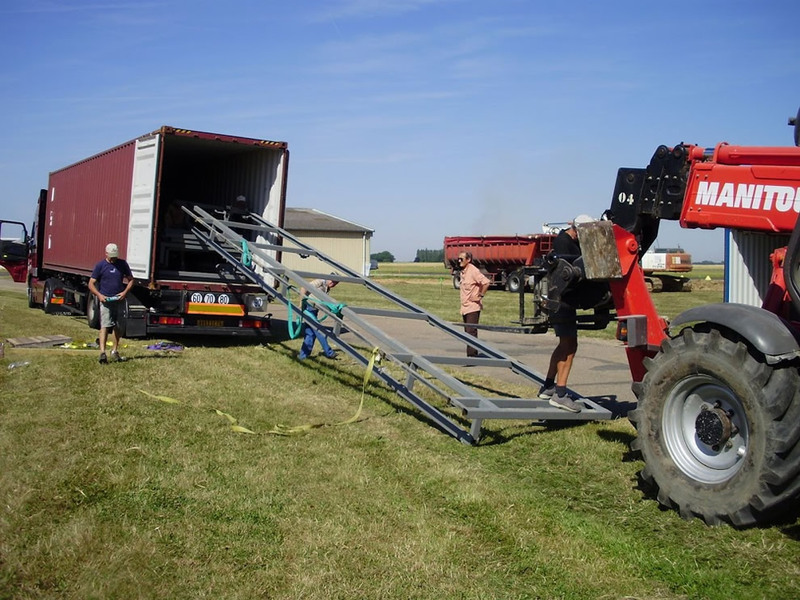 A lot of this is done overseas to locations as far as Africa," said company owner Thilo Eckardt. 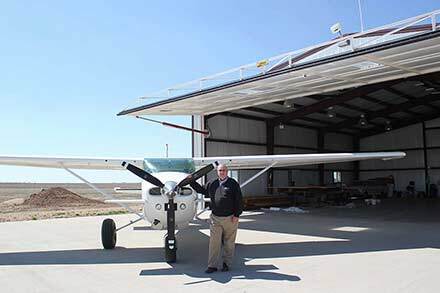 Eckardt is a former commercial airline pilot and mechanic of 30 years who also is qualified to fly helicopters. 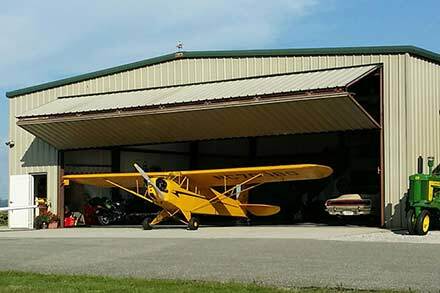 He said most of his personal flying is done in a Bonanza, 1930s Waco Biplane and a Robinson 22 helicopter. 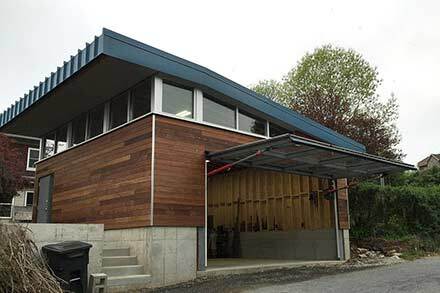 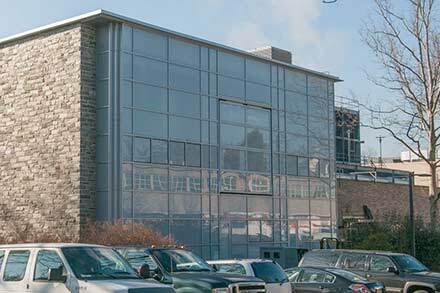 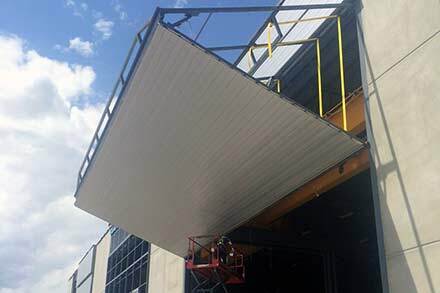 Nearing the final stages of building, installers used a forktruck to gently lift the larger 70 ft. door into place. 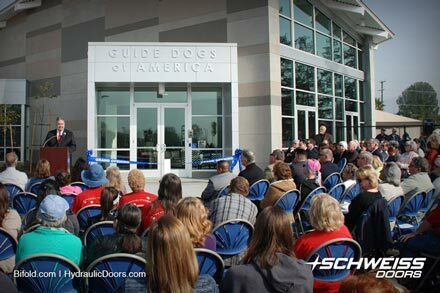 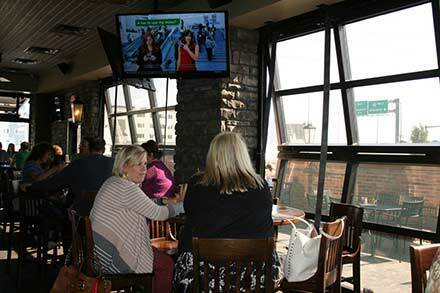 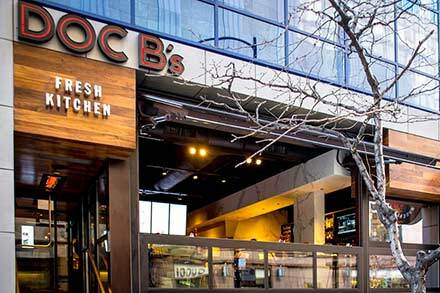 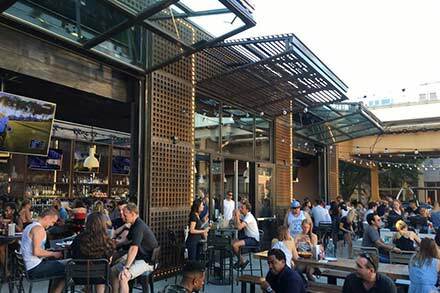 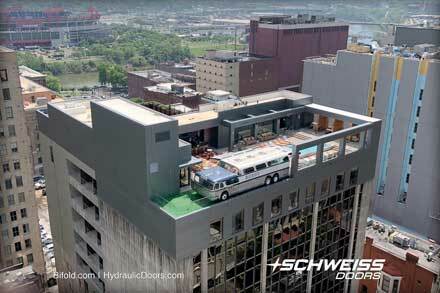 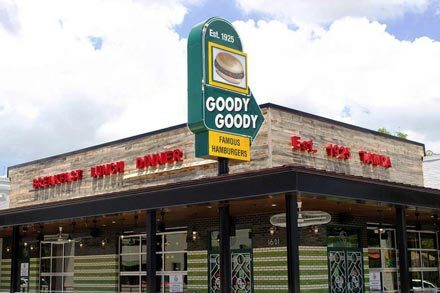 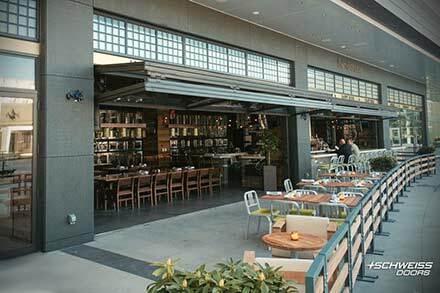 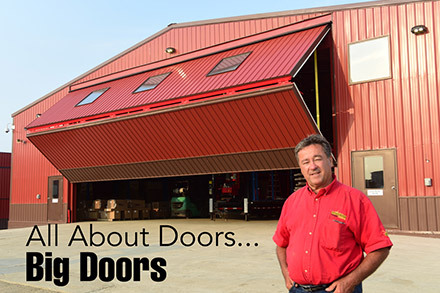 "I actually used to live in the states and saw bifold doors there for a long time. 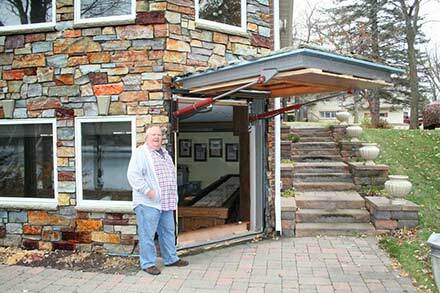 I wouldn't build anything with a sliding door again. 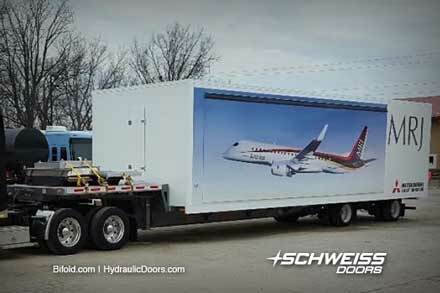 I had cable doors in the states, but like the straps better. 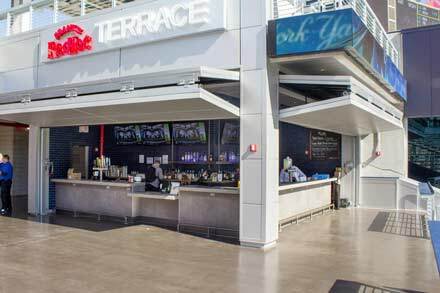 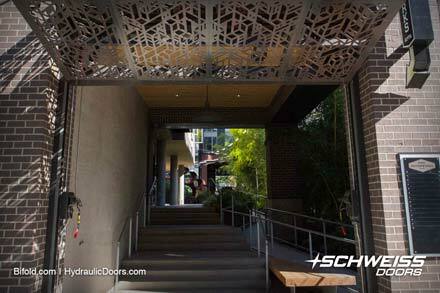 I had a French-built bifold with cables, but it never really worked right," noted Eckardt. 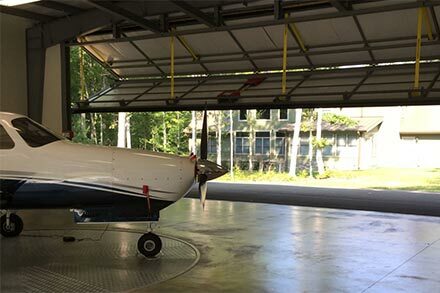 His hangar is used primarily for shop purposes; mostly for working on recreational aircraft up to small turbo-props for private and corporate use planes. 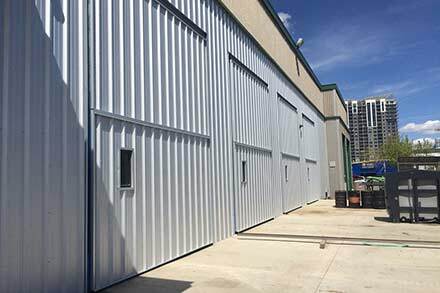 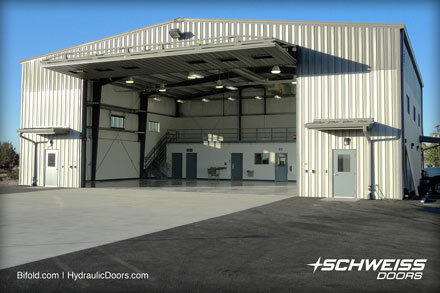 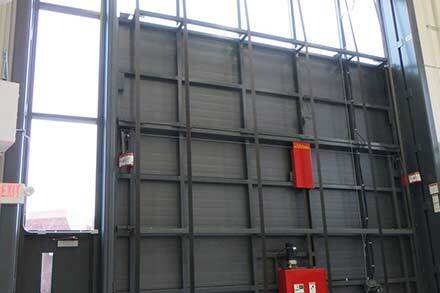 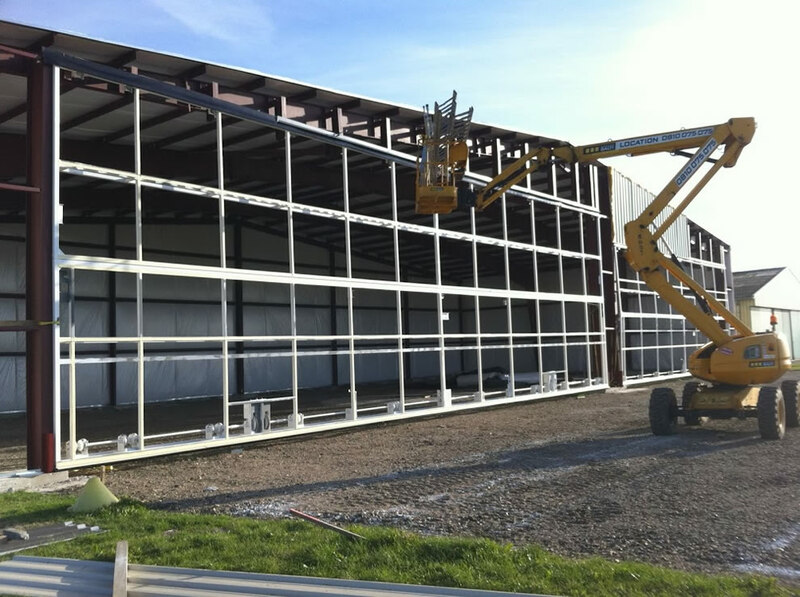 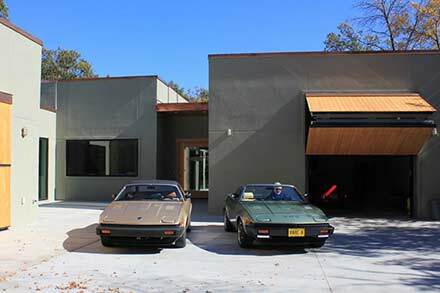 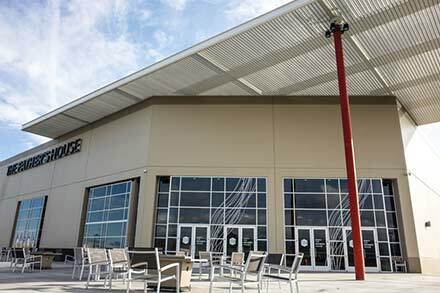 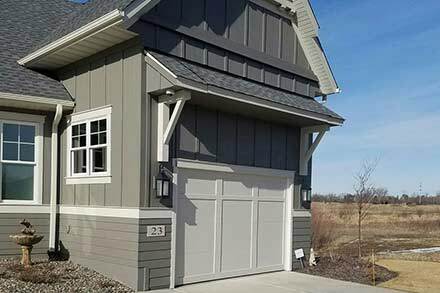 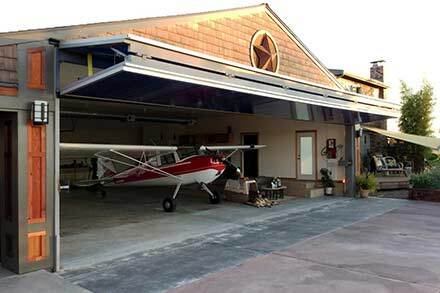 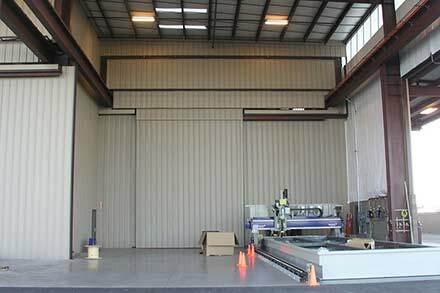 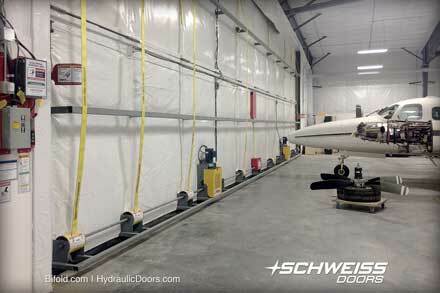 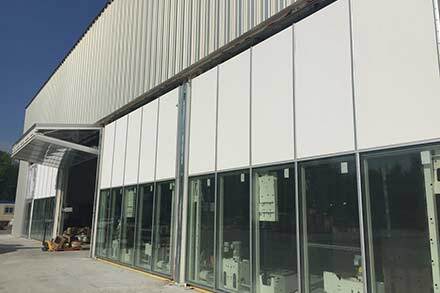 The large steel hangar which he purchased from Steel Building Supply (Rapid Set Buildings) in Colorado Springs, is equipped with two Schweiss Bifold Liftstrap doors, a 70 ft. x 22 ft. and a 50 ft. x 18.6 ft. door. 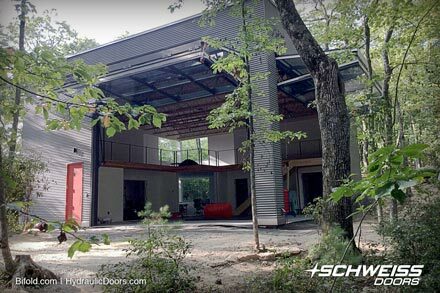 The top half of the smaller door of the two has a glass panel across it to allow for additional outside light to enter. 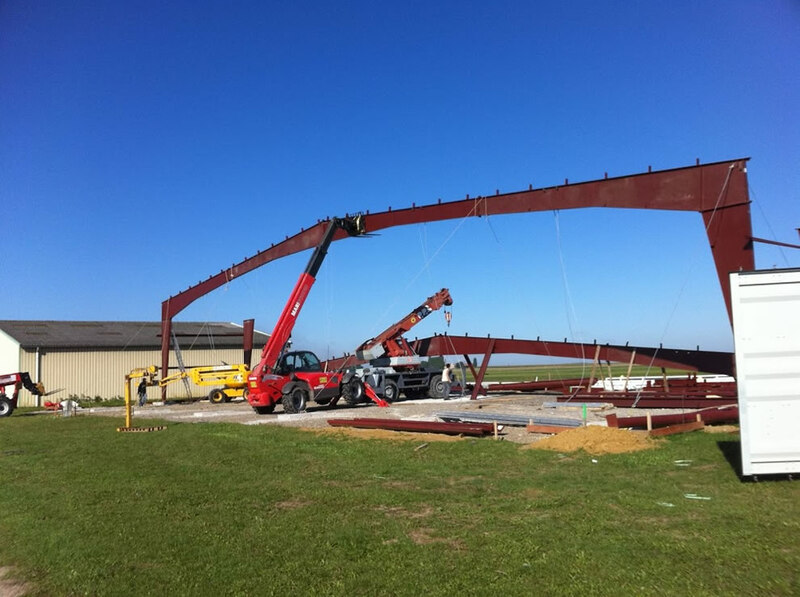 Eckhart is now in the process of building an upper office and apartment add-on with a hangar below it which will have a Schweiss 30 ft. x 10.5 ft. one piece hydraulic door on it, big enough to open for a smaller plane. 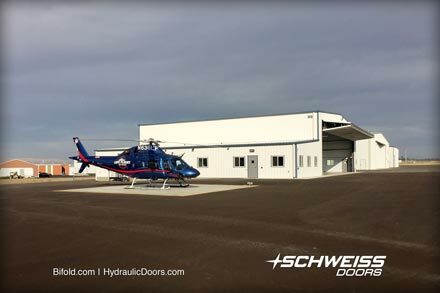 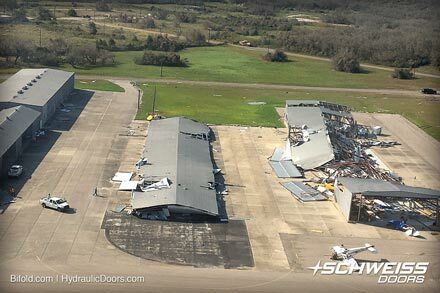 The 70 ft. door had a height of 22 ft. Aviation Experts will soon be putting a Schweiss hydraulic door on another hangar/office expansion project. 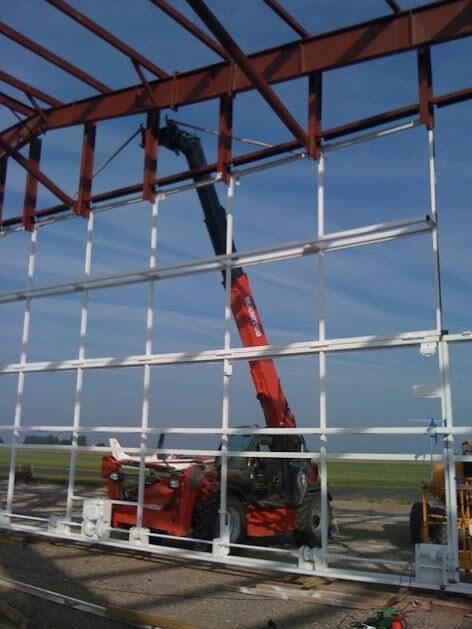 A workman in a Telehandler secured the door to the new hangar building header. 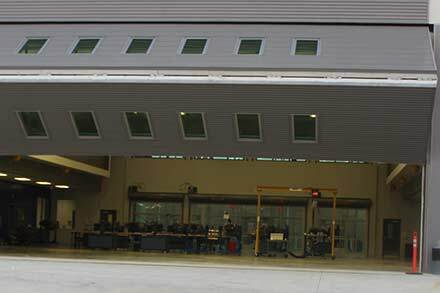 Two workers look up at the larger bifold doorframe after it was secured to the hangar. 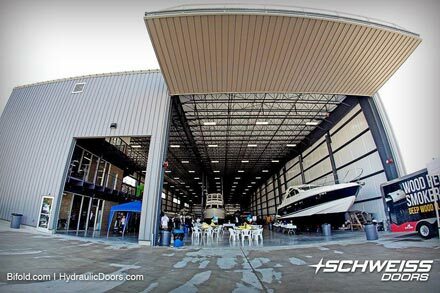 One of the Schweiss bifold doorframes is pulled from a semi truck which brought the shipping container to the Aviation Experts hangar location. 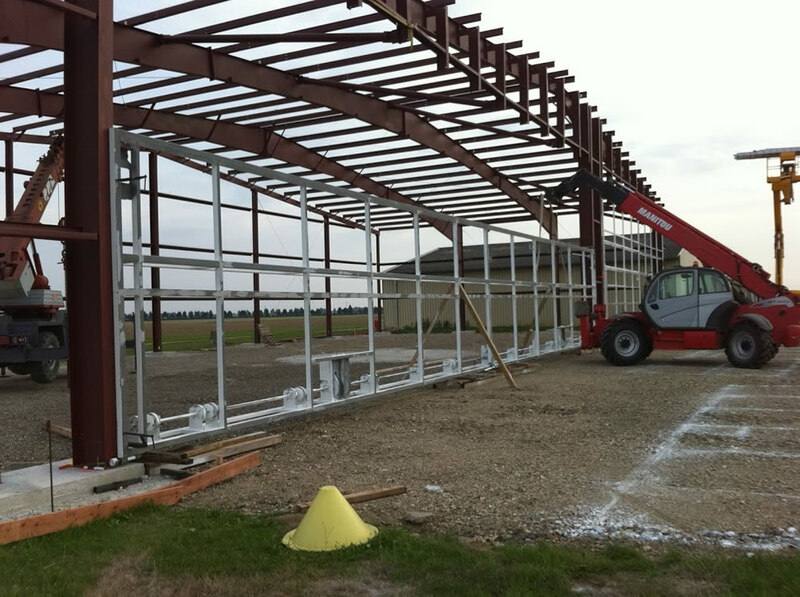 The large ridgid steel frame for the hangar goes up easily with the right equipment. 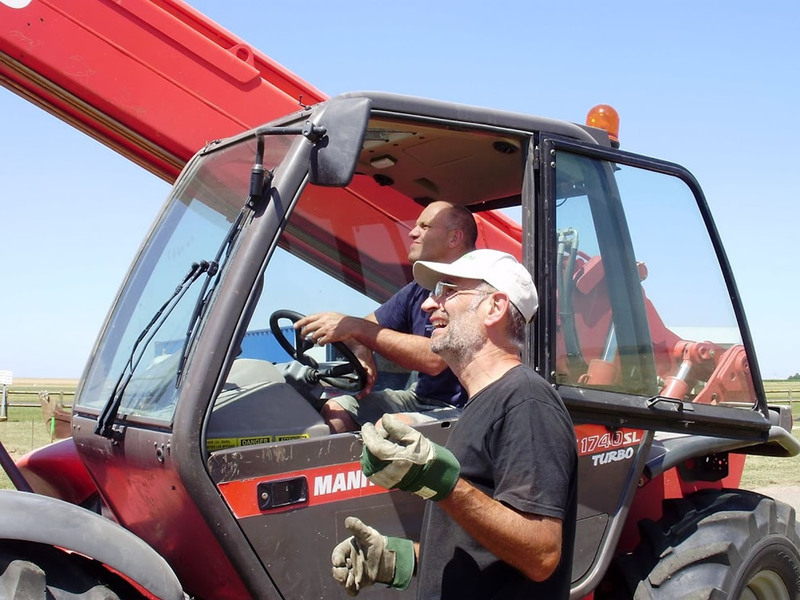 Thilo Eckhardt watches intently as his forklift driver unloads doorframes from a 40 ft. seagoing shipping container which originated from the Port of North Charleston, South Carolina. 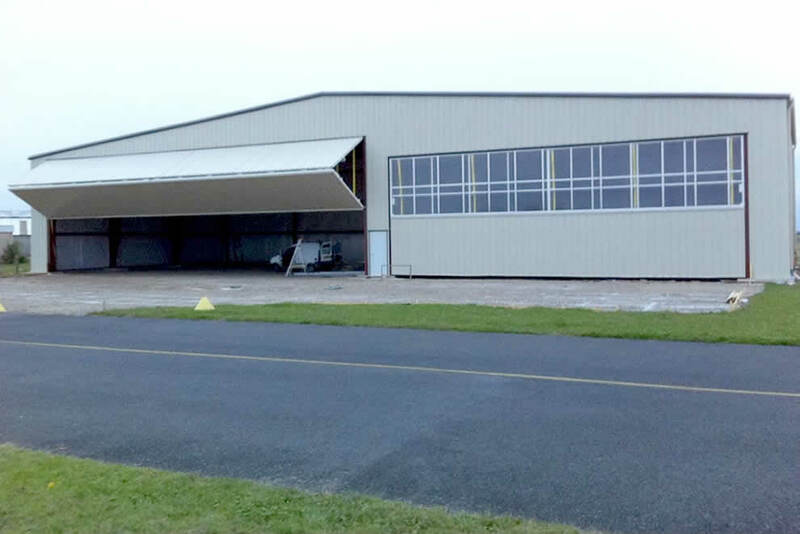 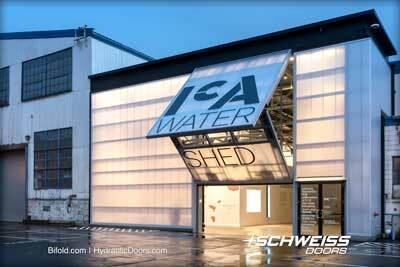 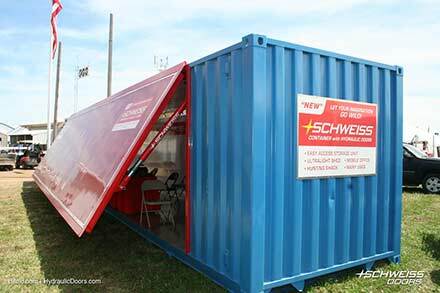 Aviation Experts, based in Nangis, France, built a new hangar and installed two Schweiss Bifold liftstrap doors on it. 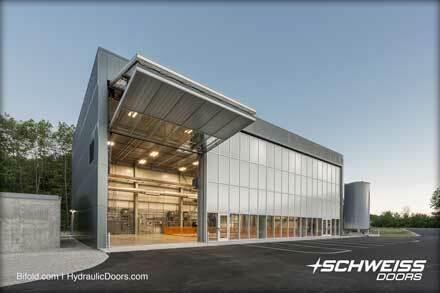 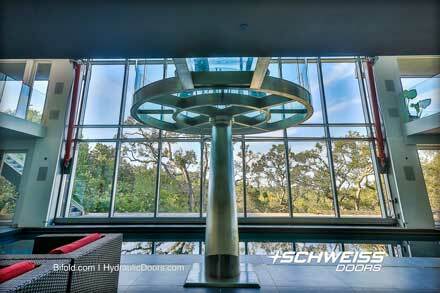 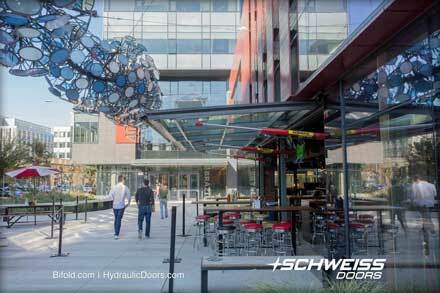 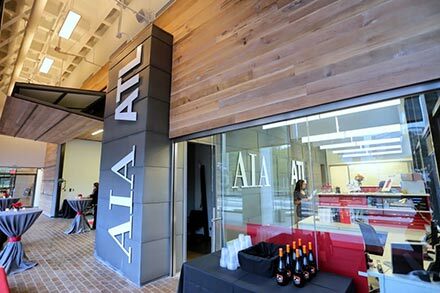 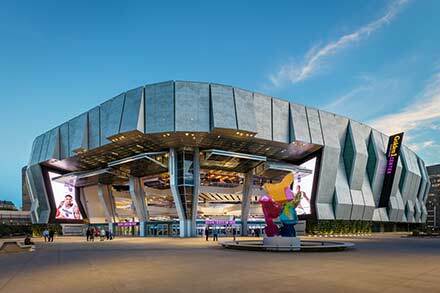 The largest door was 70 ft. x 22 ft. and another spanned 50 ft. x 18.6 ft. 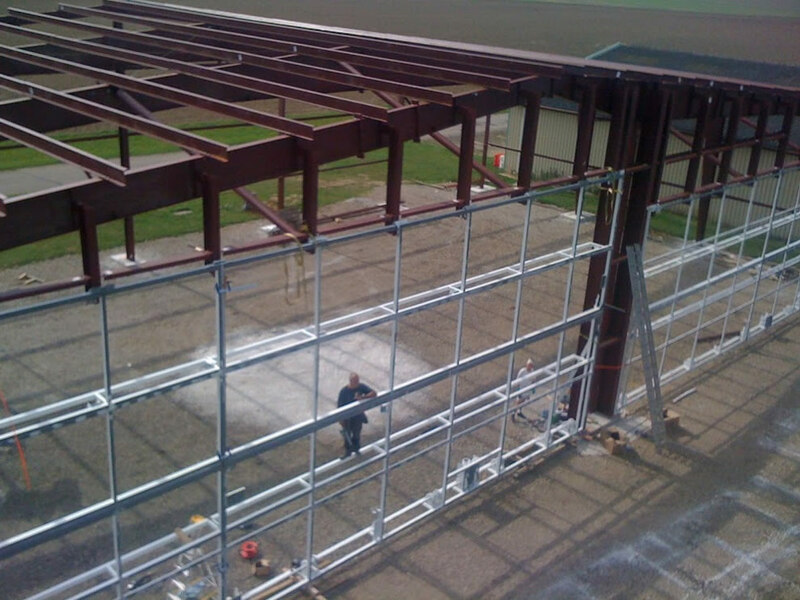 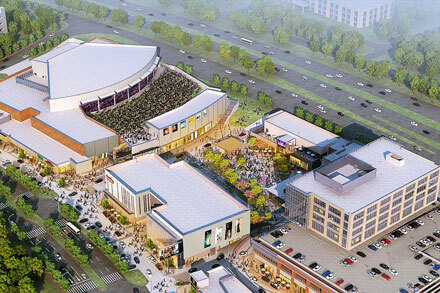 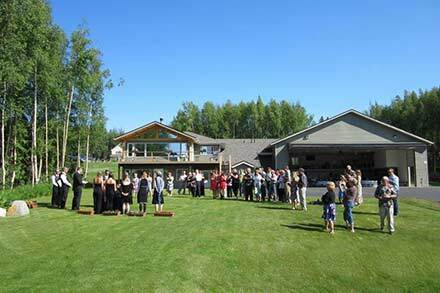 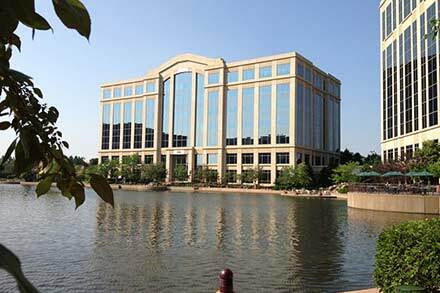 The company specializes in aerial mapping and photo surveys.